I was looking through some of my parenting notes for ideas to write about and found a summary of the book Nurture Shock. There were so many fascinating sections to this book that I had to devote a whole post to it. Nurture Shock is an accidental parenting book. 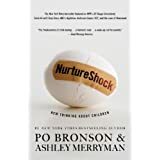 The authors, Po Bronson and Ashley Merryman, had been researching the science of motivation in grown-ups and began to wonder where kids get their self-confidence from. What they found surprised them greatly because it was the opposite of most parents’ natural instincts. They started to wonder what other parenting instincts were off-base and how this was affecting our children. They found enough material to fill a whole book with ways that “modern society’s strategies for nurturing children are in fact backfiring – because key twists in the science have been overlooked.” The book encourages us to think differently about children and make small corrections in our approaches that will have long-term impacts. I want to give a Cliff’s Notes version of some of the chapters, with the hopes that you will want to read the whole book. This book is full of amazing information. Here are summaries of a few of the chapters. *The Inverse Power of Praise Parental instinct is to praise your child in terms of how great they are: “You’re really smart!” “You’re an awesome basketball player!” “You’re such a great artist!” This type of praise can back-fire, though, for a variety of reasons. Emphasizing effort (“You must have worked really hard”) gives a child a variable that they can control. They come to see themselves as in control of their success. Emphasizing natural intelligence (“You must be smart at this”) takes success out of the child’s control, and it provides no good recipe for responding to a failure. Children praised on their natural ability are fearful of trying harder tasks because they might not be as good at them, and then they won’t look as capable. Additionally, children who think that innate intelligence is the key to success begin to discount the importance of effort – if you’re smart you don’t need to try hard, and if you do try hard you must not be naturally smart. With too much praise they get the idea that you’re either smart or you’re not, good at math or not, etc. Kids need to be taught that the brain is a muscle: giving it a harder workout makes you smarter. We need to be sure they know of their potential – that anyone can be good at math/cooking/baseball if they try long and hard enough. *The Lost Hour Children need more sleep. Many studies show a direct correlation between the amount of sleep students get and their test scores. Sleep loss is especially devastating for teens, who biologically can not go to sleep early. They are wired to stay up late, and the problem is compounded by early start times for many high schools. This sleep loss affects not only their performance in school but their mood. Teens who get more sleep have higher levels of motivation and lower levels of depression. Studies have also shown that kids (of any age) who get less sleep have higher rates of obesity. Sleep loss has a stronger correlation to obesity than TV watching. *Why White Parents Don’t Talk about Race Children are developmentally prone to in-group favoritism. The attribute they rely on is that which is the most clearly visible. Don’t be surprised when they make comments about their “group” being better than the others, of any sort (skin color, teams, classes at school). They are trying to figure out the world and how they fit in. They do this by talking about it. Rather than stifling that conversation, discuss race OPENLY. Speak directly to them and help them understand the ways we are all the same, even though our skin colors are different. Teach them by explanation and example that everyone is equal. It’s not enough just to raise them in a diverse environment and hope they get the message. Everyone makes initial judgments, sometimes based on stereotypes, but the key is to acknowledge that those judgments come automatically and take the time to think through them and realize they may not be accurate (and speak about this process with your children). Talking openly about historical discrimination creates better attitudes toward those of other races and reduces the glorified view of white people. *Why Kids Lie Research clearly shows that children lie early and often, which surprises most people. Lying is a normal part of their development. Young children began lying to avoid punishment. As they age their reasons for lying are more complex, such as to keep secrets, manipulate social situations, or spare someone’s feelings. You can talk to your children about why lying is wrong, but be sure to include why honesty is right. Teach them that their honesty is what makes you happy. Children want to please their parents. Instead of saying, “You’ll be happy if you tell the truth,” young kids need to hear “Mommy will be really happy if you tell the truth.” Be aware that there are subtle ways you might be encouraging your child to lie, for example, telling them to be polite and say they liked a present they got, or getting angry at them for tattling, which unwittingly encourages them to hold back information. Don’t ask questions that encourage lies to keep themselves or their friends out of trouble, such as, “Did you color on the walls?” or “Who taught you that word?” Find a better way to communicate and get answers. Other chapters in this book address gifted testing, sibling relationships, teaching children self control and other social skills, and language development. The chapter on teen rebellion was very interesting and helpful to me. I will do a whole post on that topic soon.